Hello friends! It’s Jen and Jodie from Eighteen25 back today and we are excited to show you what we’ve been up to. Our most favorite ornaments are always the ones our kids make. We try to make at least one new one with them each year during Christmas break. They love it and we love it so it’s totally a win-win! This year we were brave. 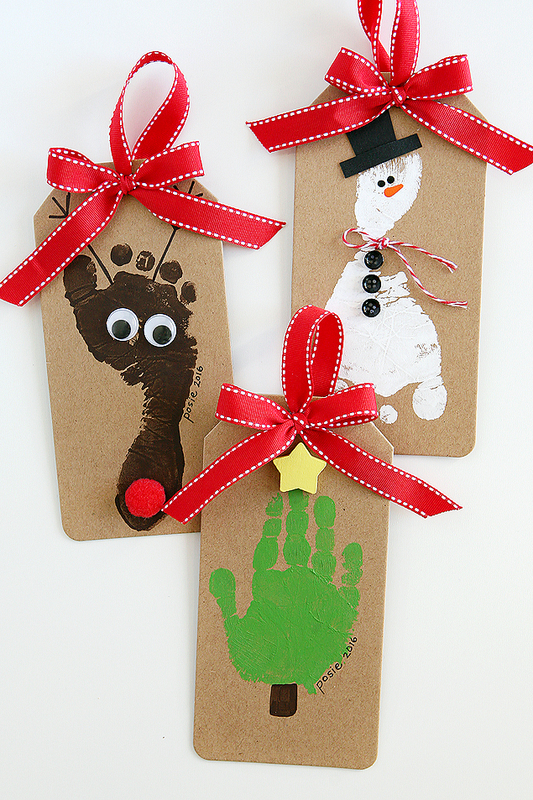 We pulled out the paints and made some of the most adorable handprint and footprint Christmas Ornaments. 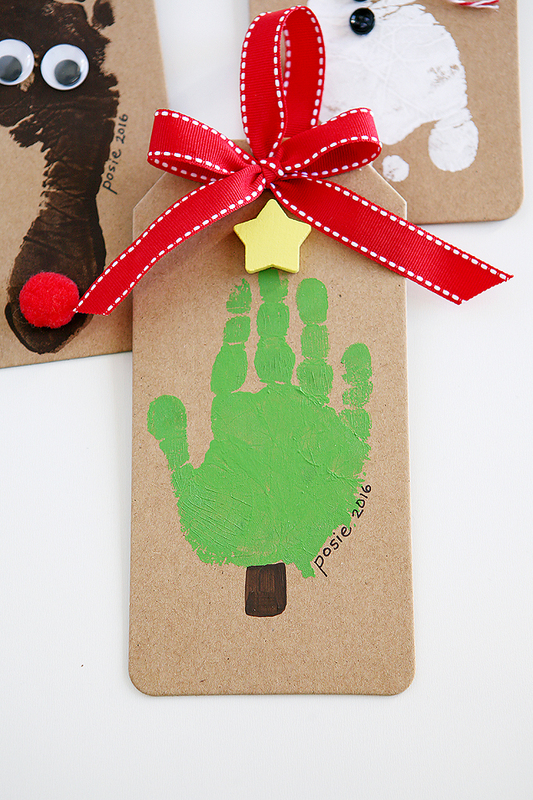 Here’s how we made the Handprint Christmas Tree Ornament. 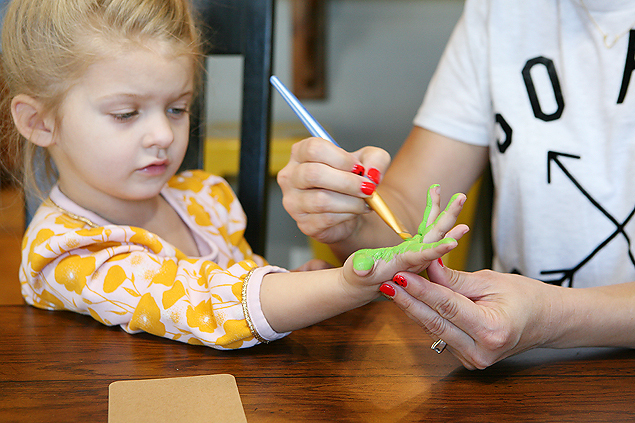 Before you do anything practice with your child a couple times how you want them to hold their hand when you make the handprint. It really does help and they take their job very seriously. haha. 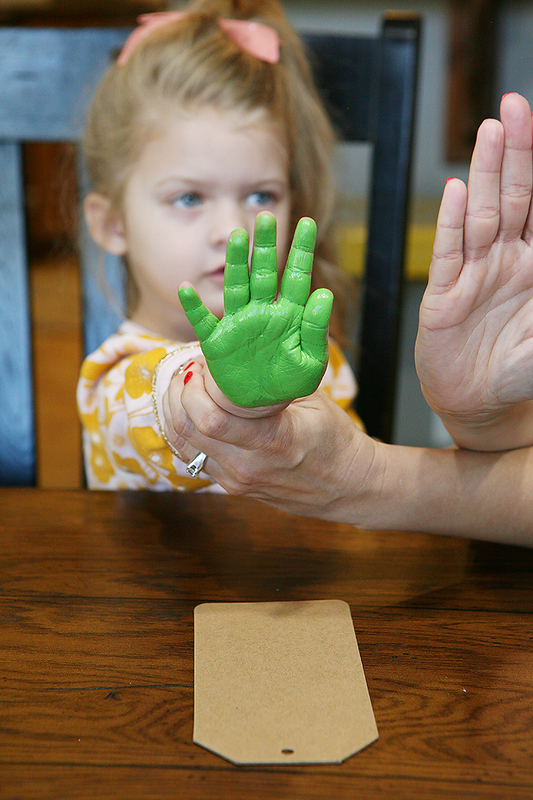 Then paint your child’s palm and fingers green. This can be a bit messy, but it’s totally manageable. We like to use baby wipes for a quick and easy clean up. 🙂 Remind them one more time how you want them to hold their hand and then firmly press it down onto your chipboard tag. Use your hand to actually press theirs down to make sure the paint comes in contact with the tag. Next, carefully use a little bit of brown paint to make the tree trunk. Then set it aside and let it dry. While that is drying you can paint your small star yellow. You could always just paint a yellow star at the top if you don’t want to buy the wood star piece. Use your glue gun to attach the star to the top of your tree. Then make a ornament hanger and bow with your ribbon. We attached the bow with the glue gun as well. Then we always like to add their name and date with a sharpie. The kids have so much fun making these and they are so proud of their masterpieces. Each year they’ll look forward to hanging their handmade ornaments on the tree. And year after year as their tiny little hands get bigger and bigger these silly little ornaments will become the most special decorations you display. If you’d like to check out how we made the Footprint Ornaments, we’d love for you to swing by our blog HERE for all the details.